Happy Sunday! This is Jaya here. Hope you all are chilling out today. The last challenge was a little tricky I guess. But our motive is to make you to try things you haven't. We all do what we like or what we are good at. Don't we? But real test of our abilities lies in coming out of our niche and doing something we haven't ! Kudos to all the awesome participant who tried their hands on our challenge! So, its Sunday and to add to your awesome day we have a New Challenge on our blog and this time. We have made your work a little easier! YES.. We have a sketch challenge for you this fortnight . 1.We are providing you a basic sketch to act as an inspiration to start your project. 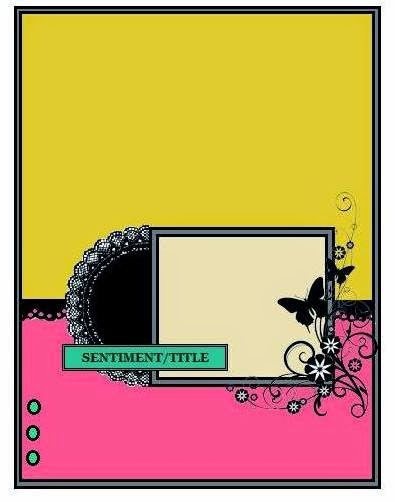 2.You can modify the sketch (rotate, mirror image) to create your cards , scrap book layouts, or altered canvas. 3.The elements of the sketch , the colours are completely your choice. The sketch is just a guide to your creativity. 4. 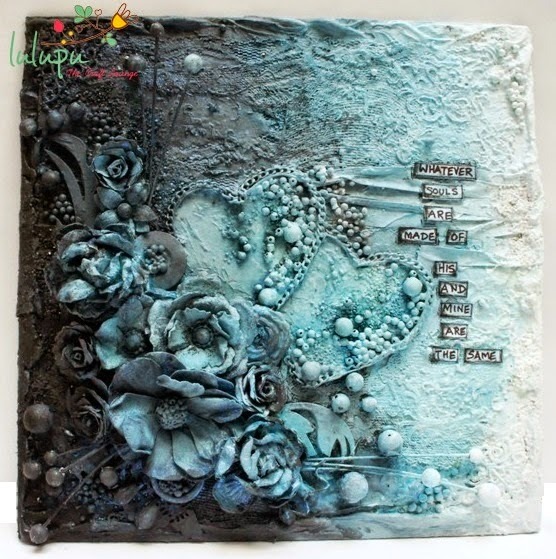 Cards, Scrapbook Layouts and Altered canvases are allowed in this challenge. Note- You may change the elements of the design .The buttons can become banners or torn/folded edge. You may also play with the shapes of the layers. We understand that the sketch cannot be followed in its entirety so we allow for variations as long as it looks that the sketch was considered. And now for the prize that is up for grabs this time!!! 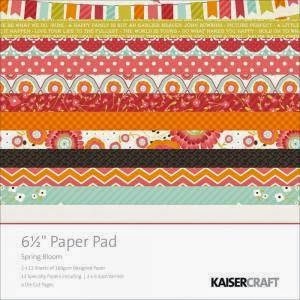 Spring Bloom Paper Pad 6.5"X6.5"
Now here is my inspiration for you. I decided to make Altered canvas. Here I have two variations of the same canvas. For the first canvas I went with the colour gradient concept. I modified my canvas in the second version as later I decided to give it a pop of colour. Since I tried these two different colour schemes , so I decided to show you how each looked. I made these canvases using some flowers and other embellishments like beads, chains etc. Most of it is throwaway stuff! I love recycling more than any thing else and always encourage you to try it in your projects too . 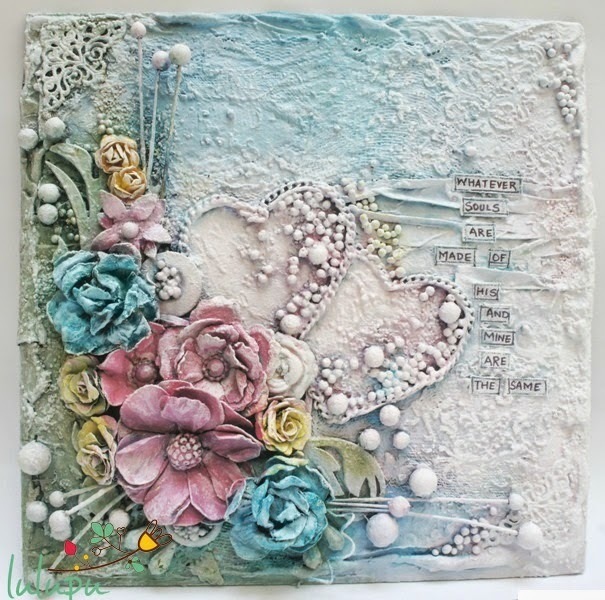 All of this (flowers and other embellishments) was stuck on a prepared canvas with hot glue. Ones I was satisfied with the placement of my flowers etc. , I gave everything a generous coat of Sakura gesso. Heat dried it using my Rangers heat tool. Now I used my Prima stencil and Sakura texture paste to add some more texture. Finally,coloured using paints and Lindy's Sprays. Just love using them on all my projects! If you haven't yet tried I will advice you to grab a bottle soon and do that. I can assure, you will land up using them on almost all your projects! These magic bottles are addictive! . Lulupu has a wide range of Lindy's sprays and magicals for you to choose at your hearts content. So do not forget to take part in our challenge. Your canvases are to DIE for Jaya. This is some insanely talented work. I loved that you used the Emily Bronte quote! I love that quote so much! Thank you Somdeepa! I love this quote too..my fav! Awesome work Jaya. Love both versions. OMG this absolutely AWESOME Jaya...recycled stuff used so innovatively. Both are Superb !! Amazing work Jaya, both your canvases are so gorgeous ..love your bold color choice on the first one its so unique ! Wow ! Jaya ..both of them are just amazing ! This is so beautiful jaya!!! Both of the canvases are amazing! ! Ohh my, Stunning canvas, Jaya, with rich colors ans texture..great inspiration!! Hope I did justice to Jaya's awesome sketch, just added my entry!